12 April - 20 October. 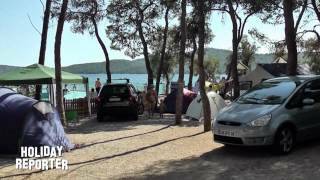 Solaris Camping is a very large site situated on the coast some 90 km. south of Zadar and 6 km. from Sibenik. 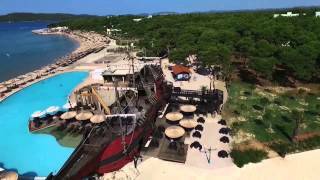 It forms part of the modern, well equipped Solaris holiday complex located right on the beach and surrounded by olive trees and a tall pine forest. The one kilometre long concrete beach has steps that lead directly into the sea, and there is also a small pebbled cove. There are around 1,200 pitches with 792 level shady pitches for touring, all with 6A electricity. The complex offers numerous recreational facilities (many at extra cost) including bars and restaurants, shops, a disco, several swimming pools, an aqua pool, a seawater swimming pool, tennis, beach volleyball and fitness equipment. There is a supermarket, a souvenir shop, a restaurant and a beach bar. Guests can also book diving, sailing and windsurfing lessons. For the youngest guests there is a miniclub and a water slide. For an additional fee, campers can also use the wellness centre at the nearby hotel. The sanitary blocks have facilities for babies and disabled visitors. Motorhome services. Several restaurants, bars and an ice-cream kiosk. Indoor and outdoor swimming pools with slides (Aquapark). Sea swimming. Beach volleyball. Tennis. windsurfing, boat hire. Extensive entertainment program for all the family. Bicycle hire. Excursions to the Dalmatian coast. WiFi (charged). No open fire and charcoal barbecues. Leave the A1 motorway north of Split at exit 22. Take the D33 then D8 to Brodarica (8 km). Turn northwest on local road to site (3 km).